With more fishermen being concerned with dwindling fish populations and conservation, many are practicing catch and release, leaving their quarry to live another day. In order to do this more effectively, special tools have been developed that make it easier to release the fish with the smallest amount of stress and injury. These catch and release tools take a little practice, but make it less likely that the fish needs to be handled. Handling can harm the fish's mucus coating and scales, causing injury and stress. Improper handling of fish can increase the likelihood that they'll end up dying after being released. This is why it is so important to use the proper catch and release tools. The most well-known of these catch and release fish hook removers is the Baker Original HooKouT. The Baker HooKkouT safely removes hooks, artificial lures and delicate flies with its powerful, spring-operated, non-slip jaws. A right-angle design also gives you a clear view for removing deeply swallowed hooks. At 9 1/2” long, this tool is made of steel and zinc-plated to assure rust resistance for many years. Anglers have used the Baker HooKouT for over 50 years proving that it’s a safe way to remove hooks and lures. While it is true that you can get a pair of forceps for less than the $20 cost of this tool, they tend to tear apart flies. Using this tool will help you to use proper release techniques, so fewer fish are lost to injury and stress. It can actually remove a hook intact while the fish is still in the water. This tool attaches easily to your vest with a retractor, so it is always handy when you need it. For the fly fisher, perhaps the junior member of the family will be more advantageous. Because of its compact size, the Mini HooKouT is ideal for use on smaller fish and by fly fisherman. With its T-shaped handle, it can slip into any pocket for easy access. The Mini is easy to use: just squeeze, twist and remove a hook or lure. Made of non-corrosive materials it will provide many years of use. 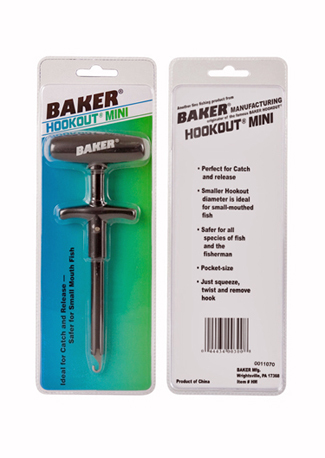 As with all Baker HooKouT’s the Mini is great for catch and release. Another style that costs a little less is the ARC Dehooker. The handle looks a little like what you'd find on an ice pick. A long metal piece extends down into a small loop that is used to retrieve hooks and flies. It comes in a variety of sizes to address different sizes of fish. If you are after extremely large saltwater fish, there is a version that is attached to a long pole. These large sizes range from $142 to $250. Another of the line of fish hook removers and an even less expensive version, features a stainless steel flange that guides the loop at the end to the curve of the hook. Just a little flip of the wrist and the fish is free. 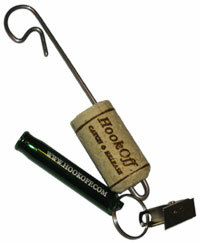 The HookOff features a lightweight cork handle so if it is accidentally dropped in the water, it remains floating for easy retrieval. An attached whistle makes it easy to signal to your companions that you have a fish on the line, or it can be used if you need assistance. A secure clip is included so you can attach the release tool to your vest or lanyard for easy access. This tool does not harm flies, so you can retrieve them for use later. This tool can also be used with a net. 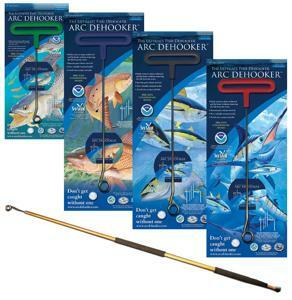 Proceeds from the sale of this tool go to fish conservation organizations. The Fish-Ng Hook Remover and Gaff remind one of a hay hook. The handles are similar, and the gaff could probably do double duty if it were heavier. This tool also comes with a lifetime warranty. Each piece can be purchased separately or the set of three can be had for $50. The hook removers' tips are bent into a thin hook shape to catch your fly, so you can flip the hook out of the fish's mouth. As you can see, with the growing popularity of catch and release, there are several fish hook removers currently on the market that will help you do this properly. Choose the one that works best for you, and share the fun of fishing.